If you would like to order more than 282, please give us a call at (800) 741-7755 or email us at sales@usmicroproducts.com. We stock these products in our warehouse in Texas. For same day processing, please place your order before 3:00pm Central US Time Monday through Friday. If the order is placed during the weekend or a holiday, the order will be processed the next business day. For International orders, please call 512-385-9000. This beautiful 1.4" round AMOLED with integrated touch will take your product to the next level. Make it stand out; wow your customers with the high resolution, vibrant colors, excellent contrast, and thin profile. 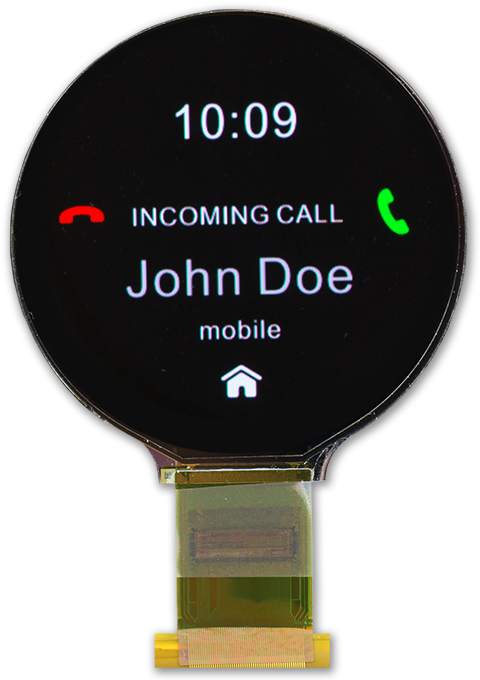 If you are creating a wearable, the wide viewing angles, low profile and low power consumption will give you a competitive advantage. If you are designing a medical device, the high resolution and amazing contrast will provide the necessary accuracy. Interested in this product? Have questions? Contact our skilled Display Engineers at sales@usmicroproducts.com.